Anil Kumble is Most Wicket taker for India in International cricket. He is form Karnataka. He played more than 18 years for India tacking 619 wickets in test and 337 wickets in one day internationals also he is only second person who took 10 wickets in one innings . Anil Kumble is one of most success full spinner for all time in international cricket. Anil Radhakrishnan Kumble born in October 17. 1970 in Bangalore, Karnataka. 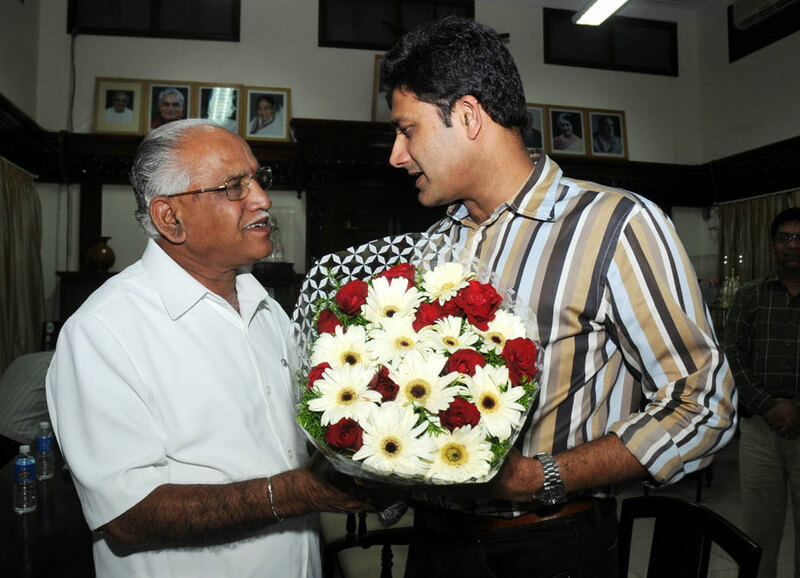 Kumble did his primary schooling at Holy Saint English School and his high schooling at National High School, Basavanagudi. He got UG from National College, Basavanagudi. Kumble graduated from Rashtreeya Vidyalaya College of Engineering in Mechanical Engineering in year 1991–92. Anil kumble start is carries has fast blower, the change is style as spinner. Anil is Leg spinner as which most famous flipper . he made his first class debut for Karnataka in 1989 against Hyderabad. He played under 19 against Pakistan in the same year, He made his ODI debut against Sri Lanka at Sharjah in the Australasia Cup on 25 April 1990. In the same year he made is test debut against England . but he struggle in that year. Anil kumble take total of 619 wickets in 132 tests in an 18 year long international career, Kumble finished his career as the highest wicket taker for India and the third highest overall. His match winning abilities could be seen from the fact that out of his 619 wickets, 288 came in 43 tests which India won. Kumble was the main stay of Indian bowling during the 90's and took almost 31% of India's wickets in his 132 tests. The fragility of the Indian batting line-up abroad meant that Kumble's role was cut short to that of a containing bowler than an attacking one. Nonetheless, he still stood apart from the rest and took 269 wickets in his 69 away tests with a decent average of 35.85 and a strike rate of 74.5. Although his numbers may not be as good as Murlitharans or Warnes, but Kumble can boast of something which his other two contemporaries can't – a test century against England at Oval in 2007. He is in fouth blower in list of world cricket took most wickets for life time. A prominent intersection in M. G. Road, Bangalore has been named after Anil Kumble. This article is about Rahul Dravid, undoubtedly one of the greatest & finest ambassadors to have ever played the game of cricket. In this article I will take you through a complete journey of Dravid’s profile, family, his career as a cricketer, records & achievements. In this article, I have taken Mr. Kanagal to talk about including his film careen and personnel life. In this aarticle I will explain you about the early life of Super Star Rajnikanth in Bangalore, Karnataka. I have included in this article the informations, about the Days spent by Rajnikanth in Bangalore before coming Tamilnadu. Read this article to know about the international legendary cartoonist R K Laxman. Laxman has created the immortal cartoon character Common Man under the series You Said It through the Times of India daily newspaper. Born in Mysore strode as one of the colossus in the International cartoon arena. Let us see his biography sketch below. Read this article about Sri N R Narayana Murthy, Padma Vibhushan a world leader in entrepreneurship. Born in Mysore is the proud son of Karnataka who rose to command respect from the world over. Even after reaching he is a down to earth person. He co-founded the international software giant Infosys along with other 6 likeminded middle class friends.